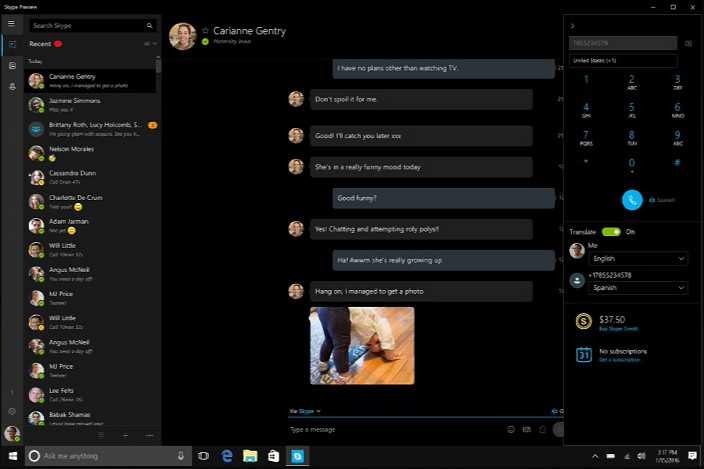 A new Skype Preview app update 11.10.141.0 for Windows 10 is now available for Insiders. The latest update is now rolling out on both PC and Mobile devices. The update brings new features like Skype Translator, a voice translation for calls to mobiles and landlines on Skype Preview. You can now use Skype to call people on their phones and communicate across languages, even if they do not have Skype. To use this feature select the dial pad, enter a phone number to see a Skype Translator option next to the call button. Tap it to bring up settings for Skype Translator. From here set the languages and place the call. Once the person on the other side picks up they will hear a short message stating that the call is being recorded and translated through Skype Translator and then you can start talking. Introduce friends and family on Skype by sharing their Skype contact details. Skype Preview app now supports Skype Translator. Capture and share video messages with friends and family on Skype, even if they’re not online. Manage your conversations and save time by marking conversations as read or unread. Now forward calls to a mobile or landline. Skype Translator currently supports nine spoken languages: English, Spanish, French, German, Chinese (Mandarin), Italian, Portuguese (Brazilian), Arabic, and Russian.